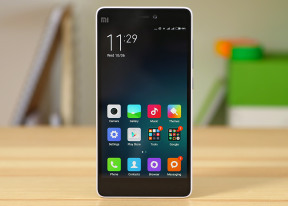 The Xiaomi Mi 4i runs on Android 5.0.2 Lollipop skinned with company's latest MIUI v6 launcher. The Xiaomi's customizations run very deep and replace everything including all Google services. In fact, the Mi phones sold in China don't have access to Google's services and those need to be sideloaded one way or the other (some resellers may even do that for you). The models sold officially markets outside of China come with the entire Google package pre-installed. Xiaomi MIUI v6 completely overhauls the user interface and thus the Material Design is barely noticeable, though it keeps much of the layout and operational logic. Xiaomi make the UI flat and has put a huge effort to simplify it as much as possible without sacrificing much functionality. The lockscreen has a clock in the top left corner - gone are the lockscreen widgets. To unlock the phone you swipe upwards and if you want a quick access to the camera - just swipe from the right side. Beyond the lockscreen is the Android homescreen with four customizable shortcuts docked at the bottom by default, but you can dock up to five items. You can have any app there or even folders with multiple items if you will. There is no app drawer - anything you install pops up on your homescreen, which can have unlimited panes. There're no shortcuts and the usual routine of removing icons (dragging them up to a recycle bin at the top of the screen) will uninstall the corresponding app. There is a pop-up for confirming the action though, so you can't accidentally uninstall apps. Homescreen widgets are available, too - tap and hold on the homescreen, then choose Widgets. There are few options available, but of course, you can get even more from the Play Store. Homescreen effects are available and you can change themes, too. A theme will change your homescreen wallpaper, lockscreen style, system icons, system font and the sound profile (you can disable changing the sound profile from settings). The notification area has two semi-transparent tabs - the first one hosts all notifications, while the second one (swipe left to access) offers customizable quick toggles and a Settings shortcut. Unfortunately, you can't directly bring the toggles page with two-finger swipe from the top as it is with other Android devices. An enhanced task switcher with Clear All option is available, too. Xiaomi provides its own cloud service for content syncing between devices. Each Mi Cloud account is granted 5GB of free storage. You can use it to backup contacts, messages, your entire gallery, call log, notes, settings, voice recordings, Browser content (history, tabs, webapp data) and your music library. Xiaomi's sync and backup service shares lots of similarities with the Apple iCloud. There is even a free Cloud Messaging option that allows you to exchange messages over the internet connection instead of being billed for SMS, but that only works between Xiaomi devices. Finally, if you signed in with your Mi Cloud account, you can opt for the Find device function - a handy feature in case you misplace your Xiaomi Mi 4i or someone steals it. Xiaomi preinstalls Google Now only on its phones outside China, when they prepare them for international markets. At the time of writing this review the Mi 4i is only officially available in China, so all units you may come across lack Google Now. We did get our review unit with pre-installed Google Play Store plus Google sync for app data, contacts, and browser data but perhaps they've been sideloaded by the reseller providing this review unit. Of course, you can sideload them yourself one way or the other if they don't come pre-installed on your unit. And once you have those, you can easily download all other Google apps such as Google Now straight from the Play Store.